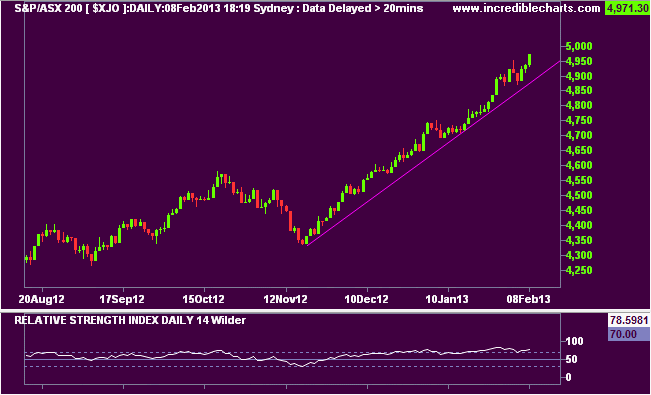 XJO has had only one down week in the past 12. The 50 point gain this week brings the ASX 200 index to a position in which it is likely to test a crucial technical level this coming week if the present incredibly strong impulsive move higher continues. Only one week in the past twelve has been negative. The closing price for the week was 4971.3. 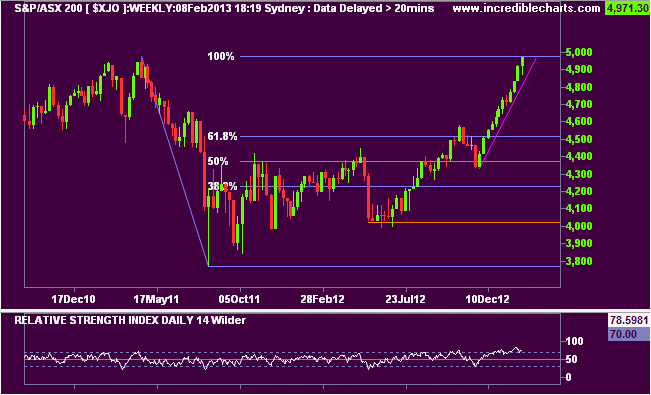 On the weekly chart it is seen to be the 100% retracement point after the second dip slide in the XJO with a high of 4971 Apr 15 2011, and a low Aug 12 of 3766. The monthly chart shows that it is the third time that resistance at 5000 has been tested. If broken, the expectation would be for continuing gains. 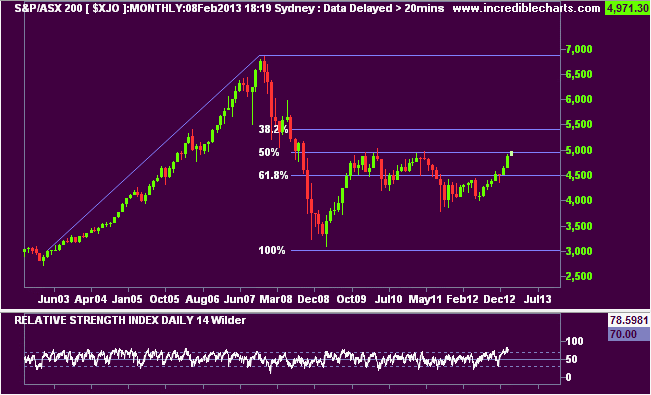 The next target would be the 38.2% Fibonacci retracement level at about 5400. This is perhaps the best known, and most used indicator of a trio introduced by technical analyst great J Welles Wilder. It is somewhat complicated to calculate, but the computer does it effortlessly. It compares moving averages of the closing prices on UP days with the closing prices on DOWN days to give an indication of the strength of any directional trend. The RSI as calculated ranges between 1 and 100, with values over 70 indicating strong upwards trending, and below 30 strong downwards trending. Since there is a tendency for prices over time to revert to a mean, it can be used as a guide when the security has been over-bought or over-sold. A common trading strategy applicable when the share-price is locked into a trading range, is to buy when the RSI retreats from the over-sold zone, and to sell when it falls from the over-bought zone. The index thus warns of the possibility of a change in short-term trend. However when the trending shows strong momentum the RSI plot will bounce along above 70 (over-bought) or below 30 (over-sold). As long as the RSI is comfortably above 70 or below 30, one can stick with any trades in the direction of the trend. With the RSI holding above 70 the expectation is that the index will break this resistance zone, and continue to make further gains. With companies now reporting interim profit results, the actual outcome will reflect the reaction of the market to these results. Will the mining stocks continue their resurgence?